A useful facility for TonePrint pedals owners, and capable of some very creative work. Free. Easy to use. Lets you really hone sounds. You can't save edits to a computer or load existing TonePrints. When TC Electronic brought out its first TonePrint pedals in 2011, it brought something new to the stompbox market. The fact that you could endlessly refresh your pedal with a series of new sounds, tailor-made by well-known players, endowed it with an open-ended possibility and, hence, longevity that ought to transcend that of mere 'ordinary' pedals. "TC became aware of the massive demand for a TonePrint editor that anyone could use, and here it is"
That's all well and good, but somewhere along the line, guitarists aware of the programming potential of the pedals wondered why they only had access to what were basically presets created by others, when what they really wanted was to get under the hood and program an exact sound themselves. 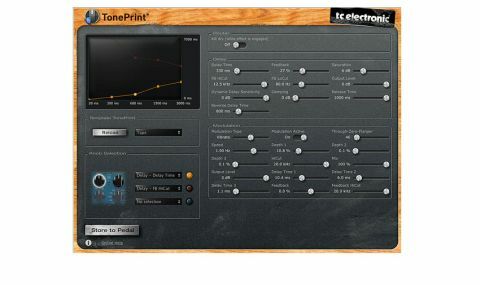 TC became aware of the massive demand for a TonePrint editor that anyone could use, and here it is. Downloadable for free from the TC website, the software installs easily and comes up as a generic graphic. Plug a TonePrint-equipped pedal into your computer via its supplied USB cable, power it up, the software will detect it and that blank slate graphic will magically fill with sliders and menus representing all of the editable parameters of the connected pedal - loads of them! It's then simply a matter of moving the sliders to change the values of the parameters that you want to tweak. You can also use the knobs on your pedal in real-time; the parameters follow onscreen. The Knob Selection section assigns different functions, enabling one knob to dial in up to three different parameters simultaneously. A graphical display shows how you've tweaked those parameters, with a different colour Modifier Curve for each. A curve at its simplest would be a straight line from the knob's lowest value to the highest, but you can alter the curve to create a series of peaks and troughs. This gives you lots of options once you get your head around it, such as one parameter decreasing as another is increasing when the knob is turned. "If TC were to implement a save function in a future software update it would also open up sharing possibilities"
As you tweak, the TonePrint Editor lets you hear changes as you play. If the idea of editing from scratch doesn't appeal, TC has handily set up a series of templates that load a generic TonePrint of a particular effect ready for customising. When done, you simply save your creation to the TonePrint memory in your pedal using the Store To Pedal function. Unfortunately, there's no way of saving it to your computer, so if you want to create another TonePrint you'll lose the first one. If TC were able to implement a save function in a future software update, not only would it make things easier but would also open up sharing possibilities. The fact that it's not possible to see the specific settings of an existing TonePrint in the Editor means you can't load existing artist TonePrints for editing, and if you put a newly created TonePrint into your pedal, try it out onstage and then find it needs a small tweak, you'll have to start from scratch again. We recommend taking a screenshot of the Editor just before you load your sound into the pedal to help with recall later. We used the TonePrint Editor successfully with three TonePrint pedals. First, the Flashback Delay, which allows pure modulation sounds - flanger, chorus or vibrato - in addition to setting up different delays. With the Corona Chorus, you get templates for four chorus types and loads of subtle variation, while the Hall Of Fame Reverb has a large selection of different reverbs as starting points for editing. If you have any TonePrint pedals, the Editor helps you put your own personality into them. While we've outlined a couple of niggles here, it would be churlish to make a big issue of them - it's free software, after all! You could have been charged for this, so kudos to TC for deciding not to do so.